CabWriter does not come with a large cumbersome library of cabinets. This was a conscience decision when we first planned CabWriter. Libraries have major problems not the least of which is you have to maintain them. Library maintenance takes enormous resources and drives the cost of the application up, which is antithetical to our pricing goals. Lastly, libraries, though large, are finite and they limit your creativity. The combination of SketchUp and CabWriter does not. 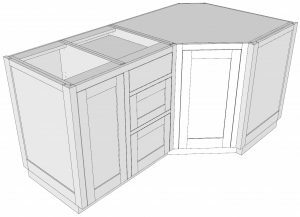 In this video I will show you how to create a diagonal end cabinet as shown in the image above right, by starting with the standard base cabinet shown in the image at left. This example will give me the opportunity to demonstrate the use of several CabWriter tools that support customizing and also give you some strategies for minimizing the amount of work you have to do. Let’s start with the latter first. The following strategies are used frequently in this video. Look for them and observe how they are used. 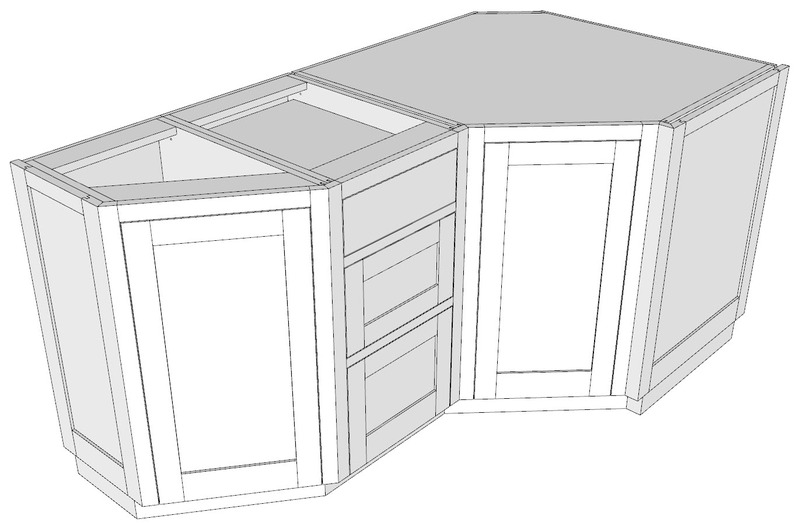 Start out by outlining the new shape of the box you desire using construction lines. The primary outline should be of the outside most shape, the face frame in this case. Then create construction lines to show the thickness of the face frame and the affected cabinet components. Minimize the number of new components you need to draw by editing or re-purposing existing parts. Editing or re-purposing parts generally involve changing a component name. DO NOT use the Entity Info dialog box or any other native SketchUp technique such as Make Unique for doing so. ALWAYS use CabWriter’s Re-Name Component tool to do this. Re-Name Component preserves all the information stored in a component such as CutList Bridge attributes. It also adds the cabinets DNA (cabinet information and CabWriter defaults) to each part. Check the bounding box of each modified and new component to be sure it is optimally set for a minimum cut list size. If it is not use the context menu Change Axes tool to optimize it. Examine each modified or new component with the Extended Entity Info dialog box to be sure all attributes are correctly set and if not update them. The Select and Move tools are your best friend. Use them judiciously. Remember the Select tool, when used in a left to right manor requires a component to be entirely in the bounding box to be part of the selection; when used in a right to left manor only requires a component to be partially in the bounding box to be part of the selection. 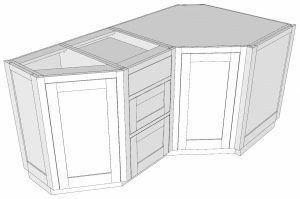 When you must create and add a new component let SketchUp assign a name. It doesn’t matter what that name is because your very next step is to use the Re-Name Component tool to make it a CabWriter component. Don’t forget to follow this with steps shown in 4 & 5 above. When naming or re-naming components use names consistent with CabWriter assigned names. For example, when adding parts to the toe kick use Stretcher, Rib, Tie and Applied Face with other positional descriptors to make up a component name. Use the Re-Number All Cabinets tool frequently. It does no harm to use it and it has the side benefit of cleaning up your model by re-sequencing the cabinet numbers and removing unused components from the model. When in doubt about the CutList Bridge attributes to use in the Extended Entity Info dialog box, examine a similar component drawn by CabWriter with the Extended Entity Info dialog box. That provides a very good clue. To follow along with this video you will need the finished model which you can download by clicking here. Start with a new model and use the dimensions for the Story Stick as shown in the Story Stick scene of the finished model. 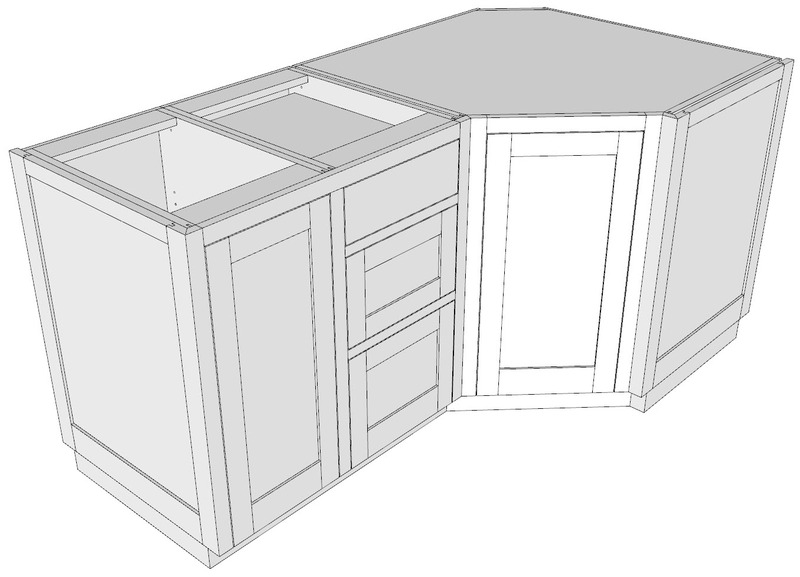 Create the cabinet shown in the image above left with the standard base box. Then proceed as demonstrated in the video. OK, it is now time to enjoy the feature film. Get the pop corn, kick back and relax as I show you how to customize a CabWriter drawn cabinet.